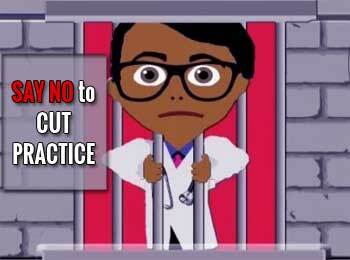 Maharashtra: The draft bill on Prevention of Cut Practices in Healthcare Services Act, 2017 which calls for a jail time for medical practitioners involved in the cut and commission practice in the state of Maharashtra is now out in the public domain for suggestions and objections. The bill spells out harsh penalties for medical practitioners, both who take cuts for referring patients/soliciting medicines, and those who give cuts/commissions stating that any healthcare Service Provider found guilty of involvement in cut practice shall be liable to be punished with simple imprisonment up to 5 years, or a fine of 50,000, or both. This will additionally draw a suspension of 3 months from the respective council. Steps have been taken to make the bill is quite exhaustive enough to cover a wide range of medical practitioners in the state. Medical Practitioners, including allopathic doctors, dentists, veterinary practitioners as well as physiotherapists fall under the bill.The preliminary draft bill, however, is as such silent on AYUSH practitioners. INCLUSION of AYUSH is MUST! NOT INCLUDING AYUSH doctors is a signal of weak draft by policy makers. Govt has no right to thrust into the private sector .This shows that the Govt has no important work for the country to attend to ,only meddling into the area of private sector . Soliciting one person or the other it not the business of the Govt . Demonetization or GST we don\’t criticize .They should try to locate black money . Don\’t bother health in private otherwise the health of the country will deteriorate .